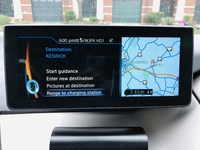 "ElectrIc range insufficient" and "Electric range low"
re: 2017 BMW i3 rEX, 33 KWh, iDrive 4.2, 13,500 miles since August, 2017. I have been getting "ElectrIc range insufficient" (ERI) and "Electric range low" (ERL) messages since early November, 2018. - I charge up to 95-100% and set my destination in the Nav system. - I begin the trip and, within a few miles, I get the ERI message. In all cases, the distance to destination is less than the available range displayed in the Instrument Cluster. And, importantly, sometimes the distance to destination is significantly less than the IC available range. - As shown in the photos 2, 3 and 4 (taken yesterday), I get the ERL message when the distance to destination is very significantly less than the Instrument Cluster range. In this particular instance, distance to destination was 2.1 miles and IC range was 118 miles. I do not recall if I have gotten both the ERI and ERL messages in the "very significant" situation but I am 99% certain that I get the ERI message when I first begin a long trip. system, When exiting a route or recalculating a route." So, as explained to me by an i3 specialist at my local BMW dealer, it is not unusual to get the ERI message during a long trip, even in ideal driving conditions where one could expect maximum range on a fully charged battery and where the distance to destination is well below the actual (versus calculated) maximum range. The i3 specialist indicated that this annoying ERI message has everything to do with how the provider of the map database calculates estimated ranges and nothing to do with any problems with BMW onboard computers, etc. Ok, so I can accept that an estimated range will often not match up with the actual range when first embarking upon a long trip. However, unless I am missing something here, there seems to be a problem when you get a ERL message for a 2.1 mile trip with a battery at 82.5% and an estimated range of 118 miles. Prior to yesterday, I have taken my i3 to a dealer twice for this problem. I guess I will be going again soon. I have noted zero performance issues with the battery but the messages are more than just annoying. You have to stop guidance to get rid of the messages. Otherwise, you have to keep hitting the Nav button on the iDrive controller to return to the Nav screen on iDrive control display. I welcome comments and insights. I should clarify . . . I begin the trip and, within a few miles, I get the ERI message. In all cases, the distance to destination is less than the available range displayed in the Instrument Cluster before starting the trip. The range drops by 25-35 miles shortly after starting the trip. Problem solved with the expert assistance from Jason at BMW of Sterling. 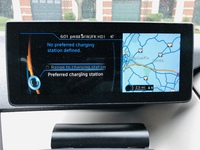 After selecting NAV Guidance, there is the menu option "Range to charging station" followed by a screen where you can set a "Preferred charging station". If you wish to avoid the range warning messages after starting a long trip, then uncheck "Preferred charging station".